Vellum is made from calfskin. Skins are steeped in lime and then scraped with a knife. Finally, they are rubbed with pumice stone to make a smooth surface. Manuscripts were written on vellum in the ancient world and it was introduced to Scotland in medieval times. The production of vellum in the Kinross area is said to have been started at the monastery on St Serf’s Island in Loch Leven, 5 km from Kinnesswood. 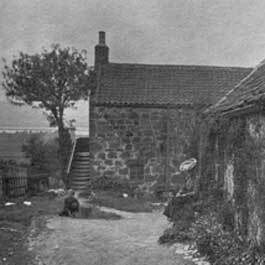 The works at Kinnesswood date from the 18th century.